The St. Ignatius High School gym filled with fans during the Tuesday evening game with standing room only left for seating. 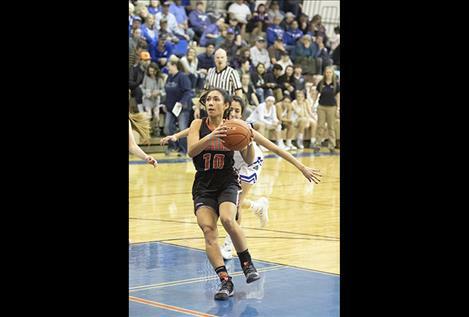 Maiden Tiana Ulutoa takes a shot with the Lady Bulldogs on defense. 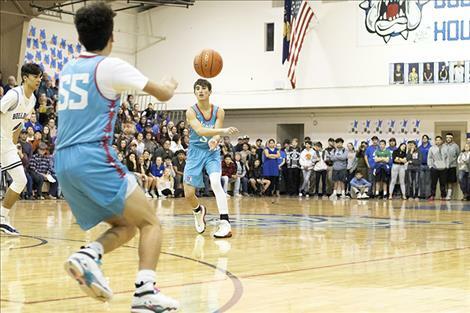 ST. IGNATIUS – Last week saw a rivalry matchup in the Mission Valley called the “Battle of the Rez” on Tuesday, Jan. 8, between the Mission Bulldogs and the visiting Arlee Warriors that packed the house. On court battles continued with other schools as well. During the Tuesday game, Johnson said the atmosphere was different than usual. “There was a lot of energy from the fans, and Nike was there.” He explained that Nike representatives have been following the team since they learned about their Warrior Movement project to battle against suicide. The Warriors created a few videos asking kids to get help if they have suicidal thoughts. The video they released in February of 2018 had thousands of views. The team recently released another video on their Facebook page. As of Monday, it had more than 50 thousand thousand views. For the Tuesday night battle, Nike sent the Warriors and Scarlets new turquois colored jerseys and game shoes. “Nike is pushing equality for all things and the turquois color is what they are using to represent that,” Pitts said. He said representatives from the company also attended the battle including Tinker Hatfield who designed some of Nike’s most popular athletic shoes and Eric Sprunk who is Nike’s chief operating officer. The Arlee Warriors and Scarlets sold raffle tickets together during the event. The two teams split the money, which was used to benefit their schools. The Bulldogs gave their cut, which was about $400, to their Special Olympics Team, who were honored during the game with a big round of applause. They gathered together on the court for a moment of recognition. 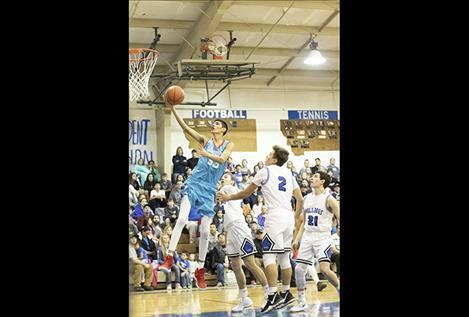 During the game, the Warriors scored a 74-59 victory over the Bulldogs to extend their winning streak to seven games this season and improve their overall record to 8-1. Johnson said the Warriors won, but it wasn’t an easy win. In the first quarter, the Warriors led the Bulldogs by a slim 11-9 margin but broke the game open with a 24-11 second quarter. “We had a little more defense than they had and we shot a little better from the three-point line and all that gave us the separation and the win,” Pitts said. For the Warriors, Greg Whitesell scored a season-high 31 points and sank five three-pointers. Johnson had 19 points, and Darshan Bolen scored 11 points. 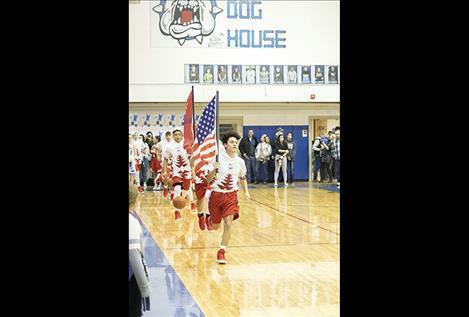 For the Bulldogs, Wacey McClure scored 15 points, and Jedi Christy scored 14 points. Bulldog Lucas Vanderburg chipped in 10 points. In the second game of the night, the Mission Lady Bulldogs won against the Scarlets in a close 68-65 matchup. The game was tied at 21 during the halftime break. 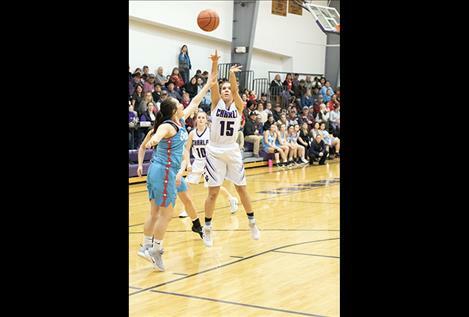 The Lady Bulldogs struggled in the third quarter and fell behind the Scarlets 51-40, but they battled back in the fourth quarter and grabbed the lead in the final minutes. Addison Arlint was one of four Lady Bulldogs to reach double figures with a team high 16 points. Madyson Currie scored 15 points. Afton Brander and Karolyna Buck both scored 12 points. For the Scarlets, Alyssia Vanderburg brought in a game high 29 points. Louetta Conko-Camel and Noelle West each chipped in with 12 points. 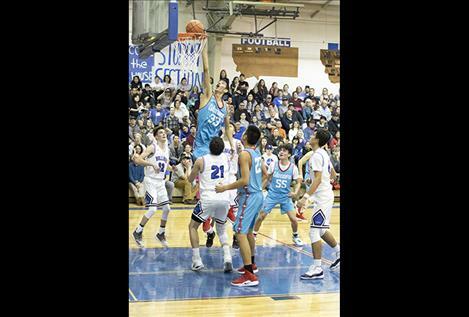 On Friday, the undefeated Charlo Vikings and Lady Vikings hosted the Arlee Warriors and Scarlets. For the Scarlets, Alyssia Vanderburg scored 29 points to hand the Lady Vikings their first loss of the season in the 53-41 game. Bella Hawk paced the Lady Vikings with 10 points. 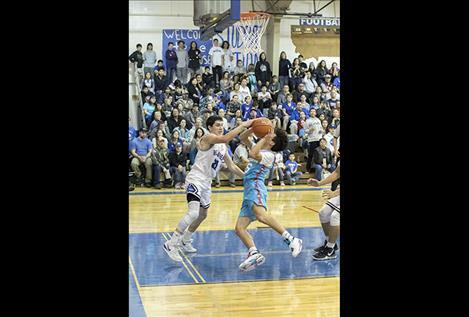 On Friday, the Warriors moved to 9-1 on the season as they defeated the Vikings 85-62 on Friday. Connor Koenig led the 9-1 Vikings with a game high 24 points, and Landers Smith added 15 points. 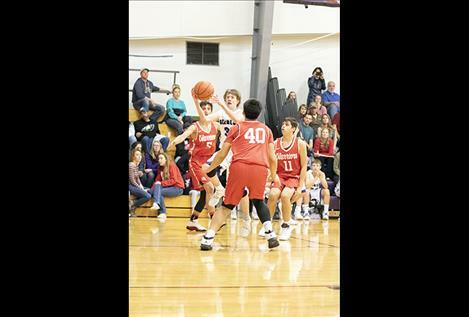 For the Warriors, Johnson paced the team with 20 points, Whitesell scored 19 and both Cody Tanner and Levi Fullerton added 10 points. Saturday evening featured the last game of rivalry week as Mission hosted the Ronan Chiefs and Maidens. 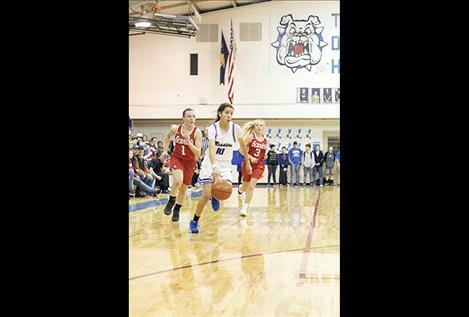 The Maidens out scored the Lady Bulldogs 18-7 in the first quarter and 13-4 in the fourth quarter to take the 49-37 road win. Tiana Ulutoa led the Maidens with a game high 20 points. Jaylea Lunceford scored 10 points. For the Lady Bulldogs, Sydney Brander and Karolyna Buck each shot eight points. The Chiefs defeated the Bulldogs in a 71-61 over-time match. 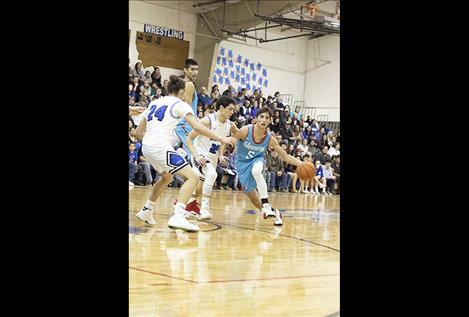 For the Chiefs, Anthony Camel led the way with 17 points, Jacob Gatch had 16 points, Dallas Durheim shot 13 points and Bubby Bush added 12 points. Bulldog Wacey McClure paced all shooters with 18 points followed by 17 points from Flint McPherson and Jedi Christy who had 13 points.